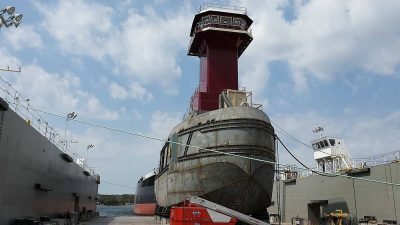 The Rotary Club of Sturgeon Bay presents the 26th Annual Shipyard Tour on Saturday, May 4, 2019. For one day each year, Fincantieri Bay Shipbuilding and CenterPointe Yacht Services open their doors to the public for tours of the shipbuilding industry. For the first time, advance Shipyard Tour tickets will be available for online purchase only. Participants who would like to guarantee a ticket and secure early bird pricing of $15 may visit the Rotary Club of Sturgeon Bay’s website https://sturgeonbayrotaryclub.org/ to purchase their tickets in advance. Due to the time constraints of a one-day event, only a limited amount of tickets will be available. Beginning Saturday, April 27 adult ticket cost will be $20; youth tickets for children ages 11-17 will remain $7. Please note that this tour requires a considerable amount of walking, standing, and steps. Tours departing at Fincantieri Bay Ship Shipbuilding and CenterPointe Yacht Services will be begin at 9 am and the last tour group will need to be in line by 1:15pm to meet the cutoff time. After the shipyard tours, guest may continue to visit the Door County Maritime Museum & Lighthouse Preservation Society, which is filled with opportunities for maritime lovers to explore and learn about shipbuilding history. Ticket purchase includes half off admission to the maritime museum on both Saturday, May 4 and Sunday, May 5.